The name Almaviva, though it has an Hispanic sonority, belongs to classical French literature: Count Almaviva is the hero of The Marriage of Figaro, the famous play by Beaumarchais (1732-1799), later turned into an opera by the genius of Mozart. The label, meanwhile, pays homage to Chile’s ancestral history, with three reproductions of a stylized design, which symbolizes the vision of the earth and the cosmos in the Mapuche civilization. The design appears on the kultrun, a ritual drum used by the Mapuche. 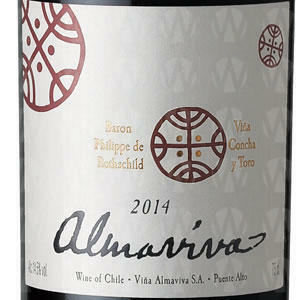 The label bears the name Almaviva in Beaumarchais’ own handwriting. Two great traditions thus join hands to offer the whole world a promise of pleasure and excellence.